[Chikanobu] could also keep up with the times. 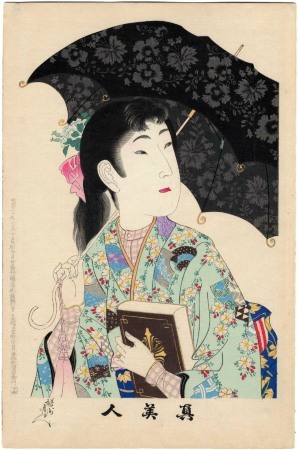 A schoolgirl is featured in a series of True Beauties of the Meiji period (1868-1912). Clues to changing fashion include the somewhat jarring combination of a buttoned-up shirt in pink and gray checks with a cherry blossom-patterned pale green kimono. The shirt tells us that she is both modern and modest, while the kimono reassures us that she is still utterly feminine. 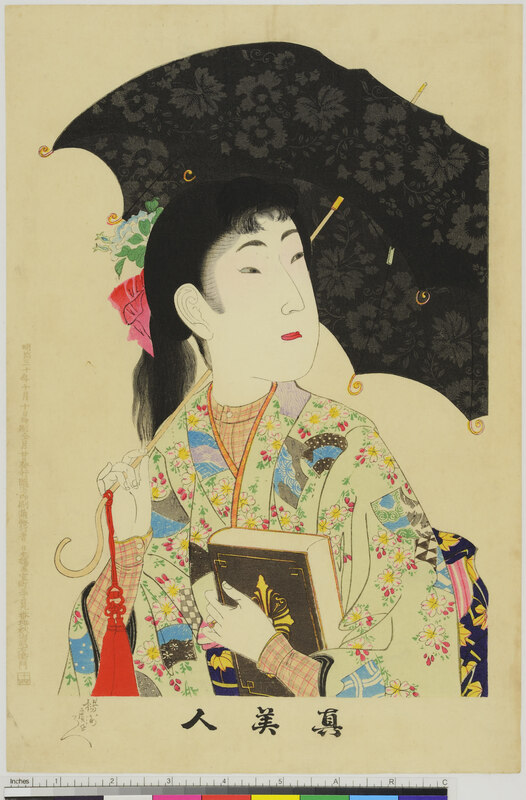 The burnished design of black-on-black flowers in the parasol and the exceptionally fine carving and printing attest to the high level of craftsmanship found in woodblock prints at he end of the nineteenth century. 1) a large color reproduction of this print in The New Wave: Twentieth-century Japanese Prints from the Robert O. Muller Collection, p. 79. 2) color in large reproduction on page 264 in The Artist's Touch The Craftsman's Hand: Three Centuries of Japanese Prints from the Portland Art Museum, p. 265 [the text]. There are at least 36 prints in this set. 34 of them are viewable at the Museum für angewandte Kunst in Vienna. There are two prints from this group in the Lyon Collection, this one and #1406.